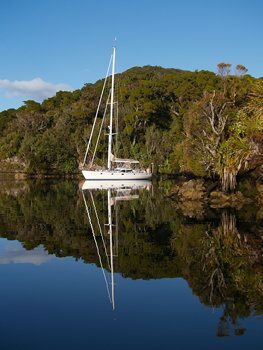 Stewart Island and in particular Port Pegasus is one of New Zealand’s best-kept secrets. Where else in the world can you find such unspoilt wilderness and isolation? Here is Duet moored in Disappointment cove strangely named, as it has the best all-round shelter. No wonder the locals call it Peacehaven. Port Pegasus is a huge inlet at the southeastern end of Stewart Island. It is divided into a north and south arm, a kind of watery T-junction with many branches off its main arteries. It is possible to find an anchorage somewhere whatever the wind direction and the distances are not large so it is easy to move quickly. Local fishermen have been using the area for years and have set up lines across many of the bays so that you can drop your anchor and tie your stern to the rope. In many of the bays it is also necessary to have lines ashore as well. In general the bays are small so two or three boats can shelter using this method of mooring rather than swinging to an anchor. As well as being a stunning scenic location, there are plenty of walks ashore and the fishing for blue cod is fantastic and unlike Fijordland, No Sandflies!.